We don’t have the final totals yet, but we are happy to say that received $3000 from Splashdown Park for our Summer Splash event, $2500 from Canadian Western Bank for our Golf Classic event and $1300 from the people who attended our Soul Train Social Glow Party event at The Park At English Bay. If you were unable to attend the events but would like to donate this is our last call for donations. 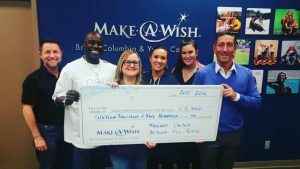 We hope you will be inspired to donate in support of Make-A-Wish BC/Yukon towards granting wishes for children and families who are battling life threatening illnesses. For donations, click this link below, choose “In Honour Of” and specify “F.U.B.A.R. Golf Classic”. If you donate online you will recieve an auto-generated tax receipt and thank you. Special thanks to everyone who volunteered, attended and donated towards the cause.